The project was more than just a chance to show off. 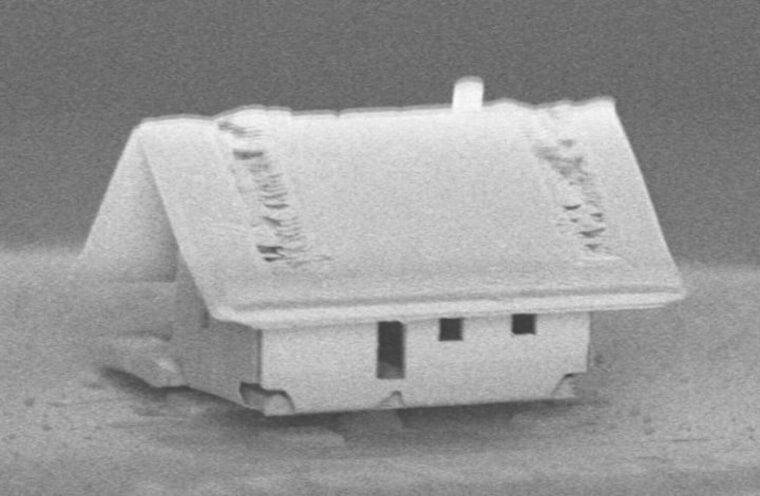 It’s the tiny house movement taken to extremes: Scientists in France have fabricated a single-story home that measures only 20 microns (millionths of a meter) across. That’s about one-fifth the width of a human hair, or roughly 500,000 times smaller than a human-scaled two-story house. The minuscule house features a tiled roof, seven windows, a door and a teensy chimney. It was created at the Femto-ST Institute in Besançon by a robot controlling a tightly focused beam of charged particles known as ions. The micro-dwelling was built inside a vacuum chamber to demonstrate the dexterity and precision of the team's robotic system. But the project was more than just a chance to show off. The scientists say the capability to create such intricate nanostructures could one day transform industries ranging from aerospace to medicine. “In the future, we want to develop this type of nanofactory in order to be able to reduce the size of a lot of objects that we use today,” Jean-Yves Rauch, an engineer at the institute and co-author of a new paper about the feat published recently in the Journal of Vacuum Science and Technology A, told NBC News MACH in an email. The robot started with a layer of silica, the main component of sand, and used the ion beam to shape the walls and cut out the windows and door. To assemble the walls, the robot used the beam to score the silica without cutting all the way through, Rauch said, and then the structure was folded into place like origami. Rauch said he and his colleagues will attempt to fabricate even smaller structures, and eventually hope to create minute biosensors on the tips of optical fibers that could measure temperature and other conditions in difficult-to-access places and could even perform more complex tasks such as detecting viruses in blood vessels. “We are not working in a new field of research," Rauch said, "but we are constantly seeking to push the limits of assembly precision and measurement precision." Want more science and tech?